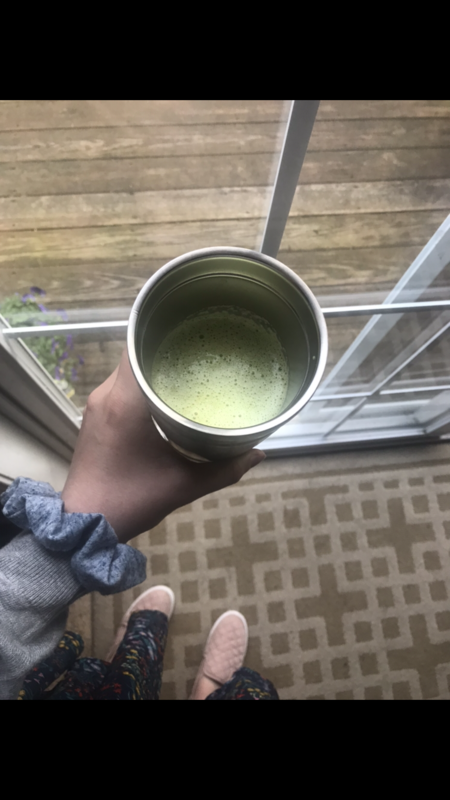 Today I am excited to share a recipe for an energizing and refreshing smoothie with you- my morning matcha smoothie. 🙂 This drink uses matcha, a type of green tea, as its key ingredient, to add a boost of caffeine that won’t make you crash and a nice flavor. Matcha, which has become increasingly more popular in the health food industry in the past few years, is a great substitute for coffee as it is high in antioxidants and promotes relaxation. While I have been enjoying matcha tea lattes (recipe coming soon!) the warmer weather has been great for these smoothies. Now, you all know how much I love to blend up smoothies for a quick breakfast with a nutrient punch, and as summer gets closer and spring schedules become busier, this is the obvious choice for a healthy breakfast or meal on the go. While I love my Raspberry Almond Breakfast Smoothie (recipe on the blog!) and other favorites, this matcha smoothie is a great way to switch things up. The addition of a frozen banana adds creaminess and natural sweetness, and the cinnamon adds a nice flavor boost to balance out your blood sugar. So, without further ado, please enjoy this morning matcha green smoothie and stay tuned for more refreshing summer recipes coming soon! To make, simply add all ingredients to blender and blend until smooth. Enjoy!